Welcome to Nemaco Technology's reference section that provides technical information for Temperature Controlled Air Conditioned (AC cooled) Rackmount Server Enclosure & Cabinet products. In particular, this technical section discusses AC Cooling for 19" Rackmount Computer Servers with Industrial grade NEMA 4 & 4X Enclosure & Cabinet housings using Industrial Air Conditioners, Vortex Coolers and Cooling Fans. Each of the cooling methods has it's own advantages and dis-advantages for the 19" Rackmount Computer Server depending the environment, electrical power source and shop air from factory air compressor. Also, certain types of AC cooling units are only available for NEMA 12 and not a NEMA 4X. Also and whenever possible we will provide internal and external photo images of the 19" Rackmount Server Enclosure & Cabinet details in the sample section. You can call Nemaco for additional information about these server rackmount enclosure & cabinet products as needed so you can find the correct enclosure for your industrial, commercial or military application. Enjoy the material that Nemaco Technology has prepared for you, and if you have any questions, please call Nemaco by telephone or complete our contact form. All Nemaco Technology's industrial 19" eia rackmount server enclosure and cabinet products are available with the following options: adjustable rack rails, clear lexan windows, temperature controlled Air Conditioners for environmental cooling, double doors, grounding studs, padlock provisions, sub-panels (powder coated carbon steel & aluminum), single shelf, adjustable shelves, custom cut-outs and many custom colors (light computer gray, industrial gray, royal blue, sunny orange, super black magic). Nemaco Technology offers industrial cooled 19" rackmount server enclosures for tough environments from the dry desert, dusty & humid factory or outdoor tropical rainforest. For each application, Nemaco Technology can get you the correct ac unit and the proper 19" rackmount environmental enclosure to get the job done for the project. The AC Cooled Enclosure (as shown in the photo) is a Black Super Tigerbox™ AC Enclosure that has a NEMA 4X rating with a temperature controlled AC unit. In particular, this AC cooled enclosure is unique since it is fabricated from 304 Stainless Steel for corrosion resistance and it has black marine epoxy coatings. Note that the AC unit was not painted when the photo was taken. The customer requested an industrially AC cooled and rugged enclosure with corrosion resistance. This industrial AC cooled enclosure was shipped to a customer that is located near a saltwater environment. Since the customer did not wanted the AC cooled enclosure to be less visible and they requested black marine epoxy coatings. The stainless steel surfaces have to be specially prepared for the black marine epoxy coatings. Stainless steel tends to have a smoother surface than carbon steel. Therefore, the stainless steel surface was roughened by orbital sanding in order to prepare a better bonding surface for the coatings. Also, Nemaco Technology offers NEMA 12 industrial A/C cooled enclosures with air conditioners for both clean lab environments and dusty factory environments. Send an email to Nemaco Technology and tell us the requirements for your AC cooled enclosure application. Nemaco Technology offers Vortex Cooling options for NEMA 4, 4X & 12 enclosures instead of using traditional freon air conditioners. Vortex Coolers can be used with there is a shop air source. And Vortex Coolers can be used in conjunction with mechanical or electronic thermostat controlled solenoid operated valves for cooling and temperature control. Also, there are no filters to clean on the vortex coolers and less maintenance than the traditional freon air conditioners. 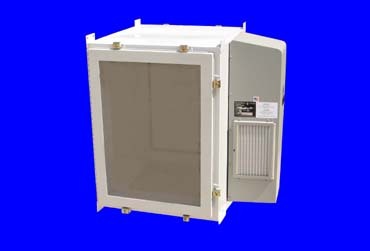 For further information refer to Nemaco Technology's section for vortex cooled enclosures. Call or send an email to Nemaco if you have any questions about your particular AC Cooled Enclosure application.